As recently announced, I am working on the publication of a new short story – Time’s Arrow. I have now done a first draft of the cover. It may need some tidying up – but here it is! In the far future Time Travel is a reality. A researcher uses it to go back in time to the Battle of Agincourt in 1415. William Chan finds much that he would expect—English archers raining arrows on the heads of heavily armed French knights, mood and blood. But there is an unexpected turn of events that have far-reaching consequences. Time’s Arrow is a time-travelling short story with a historical fantasy theme. It’s about five and a half thousand words long, so should take about twenty minutes to read. To follow soon will be an excerpt from the story. A little bit of news about my current writing project – the Stonehearted series of novellas set in the Hundred Years War. I’ve now about to finish the first draft of volume 4, which will be titles For a Heart Made of Stone. This will be now the final volume of the series! I have enjoyed writing the books, which are a face-paced action-adventure historical fiction set in the Middle Ages, but I am also looking forward too to moving onto other things! Once For a Heart Made of Stone has been edited, I will announce some more information about publication dates. 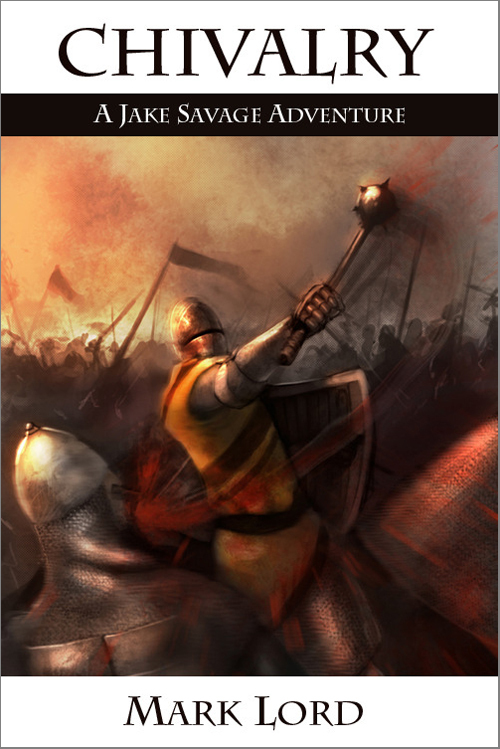 You can now grab a copy of the short story Chivalry: A Jake Savage Adventure for free from most major eBook stores. Chivalry is the first story I wrote featuring the character Jake Savage. Jake goes onto feature as one of the main characters in my novel Hell has its Demons and also in two other short stories: Bring on the Night and The King of Britain’s Head. I have another short story featuring him in the works and more to come. Through a Distant Mirror Darkly – new Medieval Short Story Collection out soon! Not all is as it seems in this collection of dark tales from the Middle Ages. Mark Lord, the author of By the Sword’s Edge and Hell has its Demons, weaves five Medieval short stories to excite, scare and enthral you. From the vicious struggle of the Hundred Years War, to legends of werewolves and rumours of necromancers and ghosts, to the bitter conflict of a castle under siege, the action and adventure never stop. These five fast-paced short stories will keep you on the edge of your seat and turning every page until you reach the end. In “Stand and Fight” Richard Hope must overcome treachery to defend the castle of Montmal from the French. Jake, an English archer in “Chivalry” must choose between his comrades and the path of honour. In “Bird Talk” a young priest discovers the woman he loves may also be a necromancer. Frederick II, the “Stupor Mundi”, the wonder of the world, is haunted by the ghost of his dead chancellor. And in “Bisclavret” a French noblewoman discovers there is more under the skin of her English husband than she could imagine. I’ll post again as soon as its published. Is diaspora an appropriate term – is it friendlier than colonialism for instance, and is the use of it by historians intended to present the spread of the Vikings in a particular way. Are all Scandinavian people Vikings? And if so, is Viking a good term, or should Norse be used? What nature did the spread of the Vikings take? Was their a consistent approach and did the different communities maintain links with each other? the possibility of an enriched creative life in the host country. Broadly speaking, however, we might already be able to speculate that for a period the dispersed Scandinavian communities of the Viking Age acted like a diaspora, retaining, synthesizing, and expressing a sense of collective identity and constructing a common cultural discourse, while new circumstances generated innovations and developments which flowed back and forth between them. ‘Diaspora’, then, is arguably not just a buzzword, nor simply a fashionable synonym, but an exploratory concept that offers a new perspective on the Viking Age. Its adoption should give the overseas settlements a greater cultural profile and a more significant role as agents of change, both in their new environments and back home.